Booking is essential, please mention ‘OH Corporates’ and bring a business card to claim you discount alongside the completed voucher below. Food only, drinks are not include in this offer. No other offer can be used in conjunction. Valid for lunch or dinner Monday – Wednesday. 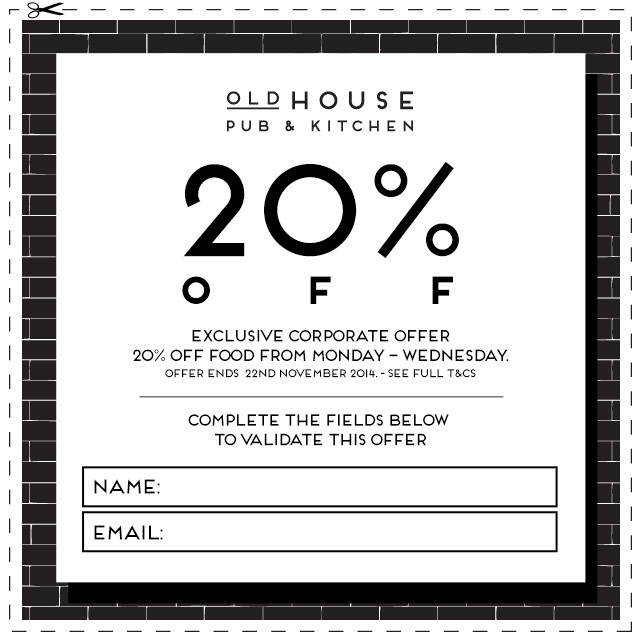 Voucher below must be printed and complete name and email. Valid business card must be presented at arrival. Offer ends 22nd November 2014. Old House reserves the right cancel the promotion at anytime. Exclusive hire of upstairs, specific areas or whole venue* with a variety of menus; sharing boards or sit down and music/entertainment tailored to suit your needs. Conference and training facilities – catered and with private room available with a projector screen accessible for DVD’s or via your laptop and internet access. Business lunches – either fast turn-around from our bar menu if you need to be back at your desk, or if you fancy settling in for the afternoon, why not impress them with 2 or 3 courses from our restaurant menu offering high-end cuisine with a homely feel. Team building – Work with our chefs and learn to make some of our signature dishes, and then serve them to your staff for a truly unique team building experience. We also have our Christmas menu available and are taking bookings now – it may seem early, but time flies…go on, treat your staff to a Christmas party to remember.